You’ve probably noticed that Android Studio doesn’t have a “clean” menu option. But we know that, like any build environment, there are intermediate files created that we may want to occasionally remove. Notice that you get a bit of an unexpected message, “BUILD SUCCESSFUL”. This simply indicates that it has gone through and successfully cleaned out the intermediate files. I’ve found that when dealing with larger projects its not uncommon to reduce the amount of disk space used by the project by 70% or more. So a bit of an unexpected solution (especially for those who’ve been in a Windows environment for a long time) but an easy one. To learn more about Android programming, checkout Jim’s Android courses on Pluralsight. 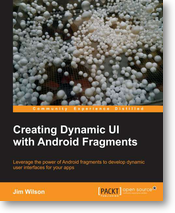 Jim’s latest book, “Creating Dynamic UI with Android Fragments” is now available on amazon.